You can exchange your full-face motorcycle helmet (any brand) and get £100 off a new Ducati Arai crash helmet. Ducati Manchester, DMC Preston, or Stoke offer you a new opportunity to continue to ride safely. Your motorbike helmet is one of the most important pieces of safety equipment you wear, it’s always with you during your travels. However, as time goes on crash helmets become loose and are less effective at protecting you to the maximum. Bring your old full-face bike helmet to one of our dealerships where you will find a choice of Ducati by Arai full-face helmets with £100 off the retail price, and your old helmet doesn’t even have to be a Ducati one! This promotion is active from 1st October until 15th December 2018. Contact us for more details. 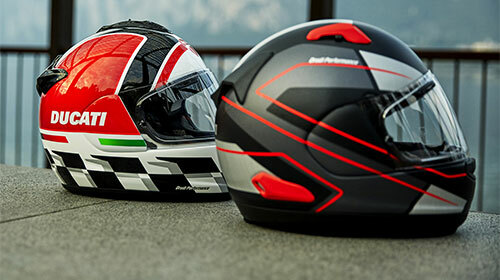 Selected Ducati Arai helmets on offer and subject to availability. Sign up for special offers, latest news and discounts.